Free doesn’t always mean “not as good as paid”, and OpenHAB is no exception. The open source home automation software far exceeds the capabilities of any other home automation system on the market – but it’s not easy to get set up. In fact, it can be downright frustrating. This guide is available to download as a free PDF. Download OpenHAB Beginner’s Guide Part 2: ZWave, MQTT, Rules and Charting now. Feel free to copy and share this with your friends and family. Z-Wave has been the dominant home automation protocol for years: it’s reliable, has been extensively developed, and works over a much longer range than any other smart home products. There’s hundreds of Z-Wave sensors available to you that perform a wide range of tasks. OpenHAB can work with Z-Wave, but is a hassle to set up, and reliability is not guaranteed. If you’re considering the purchase of a house full of Z-Wave sensors specifically for use with OpenHAB, I’d urge you to reconsider. It may work out great for you, or it may be plagued with small but persistent problems. At least, don’t buy a house full of sensors until you’ve had a chance to try out a few. The only reason to choose Z-Wave is if you’re not 100% settled on OpenHAB, and would like to leave your options open in future: Z-Wave for instance works with Samsung SmartThings Which Smart Hub for Home Automation Is Best for You? Which Smart Hub for Home Automation Is Best for You? For a while, people thought of the idea as nothing more than a gimmick, but recent product releases have shown that smart home automation is starting to live up to its promises. Read More hub, as well as Z-Wave specific hubs such as Homeseer, and a range of other software options such as Domoticz. Though OpenHAB includes a Z-Wave binding, you still need to configure the Z-Wave network first, before OpenHAB can start querying it for data. If you’ve got a Rasberry controller board, you have some software supplied for configuring the network, so we won’t be covering that here. If you bought an Aeotec USB Z-Stick controller or similar, you likely don’t have any software included, so read on. If you already have a Z-Wave network setup, you can just plug your controller into the Pi and start configuring the binding and items. If this is your first foray into Z-Wave, it’s a little more complex. First, on the hardware side: each controller has its own way of pairing with devices (technically known as “inclusion mode” in which a node ID is assigned). In the case of the Aotec Z-Stick, this means unplugging it from the USB port, and pressing the button once to place it into inclusion mode. Then take it near to the device you’re pairing, and press the inclusion button on that too (this will also vary: my Everspring socket requires the button to press 3 times in quick succession, so the lesson here is to read the manual for your device). The Z-Stick flashes briefly to indicate success. This presents problems when plugging it back into the Pi, as a new port is assigned. Restart your Pi to have it reset back to the standard port if you find it’s been dynamically reassigned a different one. Better still: don’t plug it into the Pi until you’ve done all the hardware pairings first. Since OpenHAB doesn’t actually a configuration utility for Z-Wave, we’re going to install another web management tool which does – something called HABmin. Head on over to the HABmin Github repository download the current release. Once you’ve unzipped it, you’ll find 2 .jar files in the addons directory – these should placed in the corresponding addons directory in your OpenHAB Home share (if you’re also using the Aotec gen5 Z-Stick, make sure you’ve got at least version 1.8 of the Z-Wave binding). Next, create a new folder in the webapps directory, and called it “habmin” (lowercase is important). Copy the rest of the downloaded files into there. Note: There’s also a HABmin 2 under active development. Installation is much the same but with one additional .jar addon. It might be worth trying both just to see which you prefer. If you haven’t already, plug your controller into your Pi. Type the following to find the correct port. You’re looking for anything with USB in the name, or in my particular case, the Z-stick presented itself as /dev/ttyACM0 (a modem). It might be easier to do the command once before you plug it in, and once after, so you can see what changes if you’re unsure. Open up the OpenHAB config file and modify the section on Z-Wave, uncommenting both lines and putting your actual device address. One final step for me was to allow the OpenHAB user to access the modem. Hopefully, if you’re checking the debug log, you’ll see something like this. Congratulations, you’re now talking Z-Wave. You may also find the debug log flooded with messages from various Z-Wave nodes. Let’s start by checking HABMIN to see what it’s found: http://openhab.local:8080/habmin/index.html (replacing openhab.local with your Raspberry Pi hostname or IP address). There’s a lot to see in HABMIN, but we’re only really concerned with the Configuration -> Bindings -> Z-Wave -> Devices tab, as you can see below. Expand the node to edit the location and name label for your ease of reference. Each Z-Wave device will have a specific configuration for OpenHAB. Thankfully, most devices have already been explored and there will be examples out there for yours already. Configuring custom devices that aren’t recognized is well beyond the scope of this guide, but let’s assume it is supported for now. Next up is an Aeotec Gen5 Multi-Sensor. For this one, I found a sample config at iwasdot.com, and my multisensor is on Node 2. If the format of this looks strange to you, please head on back to the first beginner’s guide Getting Started with OpenHAB Home Automation on Raspberry Pi Getting Started with OpenHAB Home Automation on Raspberry Pi OpenHAB is a mature, open source home automation platform that runs on a variety of hardware and is protocol agnostic, meaning it can connect to nearly any home automation hardware on the market today. Read More , specifically the Hue binding section, where I explain how items are added. You’ll probably only ever need to copy paste examples like this, but in case you have a new device, the binding documentation details all the commands. Before we jump into rules, I wanted to add a quick note about working with the Harmony binding. I’m a big fan of the Harmony series of ultimate remotes Logitech Harmony Ultimate Review and Giveaway Logitech Harmony Ultimate Review and Giveaway Your living room is chaos - admit it. You're forgiven for wondering which remote controls which device. What with the TV, amplifier, TiVO, BluRay player, maybe even the lighting - switching activities becomes a long... Read More to simplify the home media center experience, but they often stand as a separate system within the smart home. With OpenHAB, Logitech Harmony activities and full device control can now be a part of your centralised system, and even included in automation rules. The IP address is that of your Harmony hub. Use a network scanner to find that out. You’ll also need to enter your login details, the ones you enter when you launch the standard Harmony config utility. That’s it. Upon restarting your Hue, your debug log should have a sudden burst of output from the binding. This is a JSON formatted list of all your activities, devices, and commands that can be sent. It’s a good idea to copy this out for future reference. you can make it even easier to read with collapsible nodes by pasting into an online JSON formatter such as this one. As well as the standard PowerOff activity which is a default, you’ll find your own defined activities listed here by name. Now let’s create a simple one button control to start activities. First, in your items file, add the following line. Change the group and icon if you like. This is a two-way String binding, which is able to both fetch the current activity, and command the current activity to be something else. Now we can create a button for it, in the sitemap file. You can also refer to activities in your rules, as we’ll see next. Read the wiki page for more info on the Harmony binding. Most smart home hubs include some kind of rules creation so you can automatically react to sensor data and events in the home. 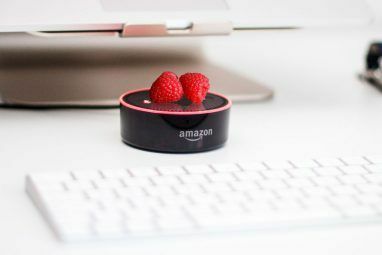 In fact, I’d argue that a truly smart home isn’t one you need to spend time interacting with mobile apps – it’s one that’s invisible to the end user and completely automated. To this end, OpenHAB also includes a powerful rules scripting language that you can program, far exceeding the complexity of most smart home hubs Battle of the Smart Home Hubs: What's Out There and What's Coming? Battle of the Smart Home Hubs: What's Out There and What's Coming? Read More or IFTTT recipes IFTTT Now Connects to Anything: Introducing the Maker Channel IFTTT Now Connects to Anything: Introducing the Maker Channel The potential uses for IFTTT are endless. But until now, it's been difficult to interface it with your own hardware projects. Today, that's all changed. Read More . rule "Office light on when James present"
rule "Office light off when James leaves"
First, we name the rule – be descriptive, so you know what event is firing. Next, we define our simple rule by saying when x is true, then do y. End signifies the closure of that particular rule. There’s a number of special words you can use in rules, but for now we’re dealing with two simple bits of syntax – Item, which allows you to query the state of something; and sendCommand, which does exactly what you think it will. I told you this was easy. It’s probably unnecessary to use a pair of rules, but as my logic gets more complex it’ll be beneficial to have them separate for whether I’m entering or leaving the area – and it might be a good idea to add a light sensor somewhere into the equation so we’re not unnecessarily turning on lights. Let’s look at another example to create a scheduled rule. Time cron "0 0 8 1/1 * ? *"
Again, we name the rule, state conditions when it should fire, and the actions to take. But in this case, we’re defining a Time pattern. The funny code you see in the quotes is a CRON expression for Quartz Scheduler (the format is slightly different to a regular CRONtab). I used cronmaker.com to help create the expression, but you can also read the format guide for a detailed explanation and more examples. My rules says simply “8am every morning, every day of the week, tell my Harmony Ultimate system to start the Exercise activity”, which in turn activates the TV, the Xbox, the amplifier, and presses the A button after a minute to launch the disk in the drive. Sadly, OpenHAB isn’t yet able to do the exercise for me. when Time cron "0 * * * * ?" highHum = hum.name + ": " + hum.state + "%"
The core of rule is in the Humidity?.members.foreach line. Humidity is a group name for my humidity sensors; .members grabs all of the items in that group; foreach iterates over them (with a curious square bracket format you’re probably not familiar with). The syntax of rules is a derivative of Xtend, so you can read the Xtend documentation if you can’t find an example to adapt. MQTT is a lightweight messaging system for machine-to-machine communication – a kind of Twitter for your Arduinos or Raspberry Pis to talk to each other (though of course it works with much more than just those). It’s rapidly gaining in popularity and finding itself a home with Internet of Things devices, which are typically low resource micro-controllers that need a reliable way to transmit sensor data back to your hub or receive remote commands. That’s exactly what’ll we’ll be doing with it. MQ Telemetry Transport was invented way back in 1999 to connect oil pipelines via slow satellite connections, specifically designed to minimise battery usage and bandwidth, while still providing reliable data delivery. Over the years the design principles have remained the same, but the use case has shifted from specialised embedded systems to general Internet of Things devices. In 2010 the protocol was released royalty free, open for anyone to use and implement. We like free. You might be wondering why we’re even bothering with yet another protocol – we already have the HTTP after all – which can be used to send quick messages between all manner of web connected systems (like OpenHAB and IFTTT, particular with the new maker channel IFTTT Now Connects to Anything: Introducing the Maker Channel IFTTT Now Connects to Anything: Introducing the Maker Channel The potential uses for IFTTT are endless. But until now, it's been difficult to interface it with your own hardware projects. Today, that's all changed. Read More ). And you’d be right. However, the processing overhead of an HTTP server is quite large – so much so that you can’t easily run one on an embedded microcontroller like the Arduino (at least, you can, but you won’t have much memory left for anything else). MQTT is the other hand is lightweight, so sending messages around your network won’t clog the pipes up, and it can easily fit into our little Arduino memory space. MQTT requires both a server (called a “broker”) and one or more clients. The server acts as a middleman, receiving messages and rebroadcasting them to any interested clients. Let’s continue with the Twitter-for-machines analogy though. Just as Twitter users can tweet their own meaningless 140 characters , and users can “follow” other users to see a curated stream of posts, MQTT clients can subscribe to a particular channel to receive all messages from there, as well as publish their own messages to that channel. This publish and subscribe pattern is referred to as pub/sub, as opposed to the tradition client/server model of HTTP. HTTP requires that you reach out to the machine you’re communicating with, say Hello, then have a back and forth of constantly acknowledging each other while you get or put data. With pub/sub, the client doing the publishing doesn’t need to know which clients are subscribed: it just pumps out the messages, and the broker redistributes them to any subscribed clients. Any client can both publish, and subscribe to topics, just like a Twitter user. Unlike Twitter though, MQTT isn’t limited to 140 characters. It’s data agnostic, so you can send small numbers or large text blocks, JSON-formatted datagrams, or even images and binary files. It isn’t that MQTT is better than HTTP for everything – but it is more suitable if we’re going to have lots of sensors all around the house, constantly reporting in. It’s also important to know that OpenHAB will not act as your MQTT broker – we’ll address that bit later. However, OpenHAB will act as a client: it can both publish your OpenHAB activity log, as well as bind particular channels to devices, so you can for instance have a switch that’s controlled by MQTT messages on a particular channel. This is ideal for creating a house full of sensors. Although OpenHAB includes an MQTT client so you can subscribe to a topic and also publish messages, it won’t act as the server. For that, you either need to use a web based MQTT broker (paid or free), or install the free software on your Pi. I’d like to keep it all in-house, so I’ve installed Mosquitto on the Pi. Unfortunately, the version available via the usual apt-get is completely out of date. Instead, let’s add the latest sources. That’s all we need to do to have an MQTT server up and running on the local network. Your broker is running on port 1883 by default. Check your MQTT server is working using the free MQTT.fx, which is cross-platform. Click the settings icon to create a new profile, and enter your Raspberry Pi’s IP address or name. Save, and hit connect. If the little traffic light in the top right turns green, you’re good to go. For a quick test, click on the “subscribe” tab, and type inTopic/ into the text box, then hit the Subscribe button. You’re now subscribed to receive message on the topic named inTopic, though it’ll be showing 0 messages. Go back to the publish tab, type inTopic into the small box, and a short message into the large text box below. Hit Publish a few times and look back on the subscribe tab. You should see a few messages having appeared in that topic. Before we add some actual sensors to our network, we need to learn about topic levels, which enable us to structure and filter the MQTT network. Topic names are case-sensitive, shouldn’t start with $, or include a space, or non-ASCII characters – standard programming practices for variable names, really. The / separator indicates a topic level, which is hierarchical, for example the following are all valid topic levels. Already, you should be seeing how this tree structure is perfect for a smart home full of sensors and devices. The best practice for use with multiple sensors in a single room is to publish each sensor variable as it’s own topic level – branching out to more specificity (as in the examples above) – rather than try to publish multiple types of sensor to the same channel. Clients can then publish or subscribe to any number of individual topic levels, or use some special wildcard characters to filter from higher up in the tree. … but not the humidity levels. Technically, you can also subscribe to the root level # which you get you absolutely everything going passing through the broker, but that can be like sticking a fire hose in your face: a bit overwhelming. Try connecting to the public MQTT broker from HiveMQ and subscribing to #. I got about 300 messages in a few seconds before my client just crashed. MQTT Beginner Tip: “/myHome/” is a different topic to “myHome/” – including a slash at the start creates a blank topic level, which while technically valid, isn’t recommended because it can be confusing. 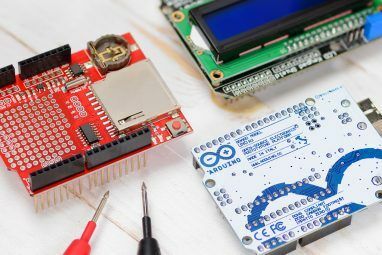 Now that we know the theory, let’s have a go with an Arduino, Ethernet Shield, and a DHT11 temperature and humidity sensor – you’ve probably got one in your starter kit, but if not, just swap out the environmental sensor for a motion sensor(or even a button). If you have a hybrid Arduino-compatible device with Wi-Fi or Ethernet built-in, that should also work. Eventually we’ll want a better/cheaper way of communicating that having to use a network connection in every room, but this serves to learn the basics. Start by downloading pubsubclient library from Github. If you’ve used the “Download as ZIP” button, the structure is a bit wrong. Unzip, rename the folder to just pubsubclient, then take the two files out of the src folder and move them up one level to the root of the downloaded folder. Then move the whole folder to your Arduino/libraries directory. Examine the code around there and you’ll see that you could easily control an LED or relay for example by sending commands to specific channels. In the example code, it simply sends a message back acknowledging receipt of the command. Upload your code, plug your Arduino into the network, and using MQTT.fx subscribe to either # or openhab/himitsu/# (or whatever you changed the room name to, but don’t forget to include the # at the end). Pretty soon you should see messages coming in; and if you send ON or OFF to the command topic, you’ll see acknowledgments coming back too. The final step in the equation is to hook this into OpenHAB. For that, of course we need a binding. And edit the config file to enable the binding. By now you should understand the format; it’s getting a Number item from the MQTT binding, on a specified topic. This a simple example, you may wish to refer to the wiki page where it can get a lot more complex. Congratulation, you now have the basis of a cheap Arduino-based sensor array. We’ll be revisiting this in future and placing the Arduino’s onto their own entirely separate RF network. I’ve also created an identical version for Wizwiki 7500 boards if you happen to have one of those. By now you probably a bunch of sensors set up, whether from Z-Wave or custom Arduinos running MQTT – so you can view the current state of those sensors at any time, and you should also be to react to their value in rules. But the interesting thing about sensor values is generally that they change over time: that’s where persistence and graphing comes in. Persistence in OpenHAB means saving the data over time. Let’s go ahead and setup RRD4J (Round Robin Database for Java), so called because data is saved in a round robin fashion – older data is discarded to compress the size of the database. Install rrd4j packages with the following commands. everyHour 	: "0 0 * * * ?" In the first part of this file, we’re defining strategies, which just means giving a name to a CRON expression. This is the same as we already did with My.OpenHAB, but this time we’re create some new strategies that we can use of everyDay, everyHour and everyMinute. I haven’t used them all yet, but I might be in future. In the second half of the file, we tell rr4dj which data values to save. As a default, we’re going to save everything each time it updates, but I’ve also specified some time based strategies for specific sensors. Temperatures I’m not too bothered about, so I’ve set that to save everyHour only, but humidity is a big concern for me, so I want to see how it’s changing every minute. If there’s other data you specifically want to save at set times, add those here now or adjust as needed. Note: if you want to graph the data too, you MUST store it at least once a minute. It doesn’t matter if your sensor data is even updated this quickly, you simply need to tell rr4dj to store it once a minute. With that defined, you should begin to see some debug output telling you that values are being stored. That’s literally all you need. Valid values for period are h, 4h, 8h, 12h, D, 3D, W, 2W, M, 2M, 4M, Y; it should be obvious what these mean. It defaults to D for a full day of data if not specified. How’s Your OpenHAB System Coming? That’s it for this installment of the guide, but don’t expect this’ll be last you hear from us about OpenHAB. 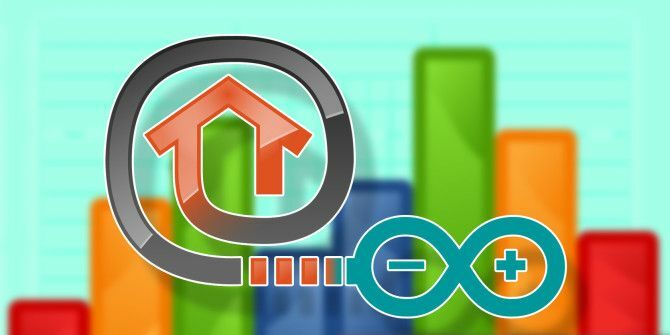 Hopefully this and the beginner’s guide have given you a solid grounding to develop your own complete OpenHAB system – but it’s a process that’s never really completely finished. Thankfully, OpenHAB can scale well from a few devices to hundreds, from simple rule complexity to the ultimate in home automation – so how’s your system coming along? Which devices did you choose? What’s the next big project you’re going to tackle? Let’s talk in the comments – and please, if you found this guide useful, click those share buttons to tell your friends how they too can setup their own OpenHAB system. 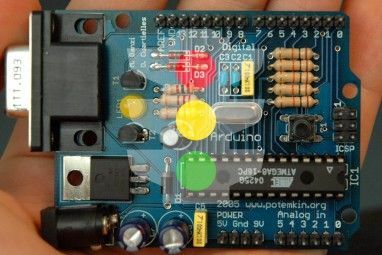 Explore more about: Arduino, Home Automation, Longform Guide. When I edit the name and location after a second or two the name/location reverts to blank (its original value). Any idea what I'm doing wrong that would cause that? Also I'm a little lost because I see the node ID in habmin but don't see where that ID is in turn referenced in openhab. What am I missing? But on github (https://github.com/openhab/openhab/wiki/Z-wave-Binding-Examples#lighting-and-bulbs) there are all kinds of other commands included in dimmers such as respond_to_basic, refresh_interval, etc. I read through their purpose here (https://github.com/openhab/openhab/wiki/Z-Wave-Binding) and don't think I'm missing anything but I wanted to double check. Also, on my openhab web interface for this light I have an up and down arrow which turns the light on/off but on my openhab app I have a slider where I can control the dimming, I wonder why I don't have the same in the openhab web interface....Does it look like I've assembled the item declaration correctly? The web/phone interface can vary a lot though, yes, it's one of the biggest complaints. I would post for help in the OpenHAB discussion group - somewhere there will be more experienced with dimmers than me. How refreshing to see a well thought-out, thorough, and RECENT piece like this. Thank you very much, it answers all kinds of questions that I'd otherwise have to scour the Internet one-by-one to find the answers to. You mentioned: "If you’re considering the purchase of a house full of Z-Wave sensors specifically for use with OpenHAB, I’d urge you to reconsider.". I don't YET have a houseful of Z-Wave sensors, but I plan on it eventually. Since you urge to reconsider, what WOULD you recommend besides Z-wave for one who is not yet fully invested?? At this point, I might actually retract that statement. Z-Wave is an arse to set up, but once running, very reliable - I've since expanded my system with more multisensors. If you don't like OpenHAB though, HomeSeer is probably the next best Z-Wave compatible system and that's quite pricey. I tried Home Assistant recently, and it was terrible with Z-Wave devices and generally quite unreliable. Hi man, i want to buy a harmony hub and I found this one: Boxe Logitech HARMONY(R) HOME HUB-OTHER-EMEA which has this serial no: 915-000262! What do you think? I couldn't find specific tehnical details abut the product like how many devices can controll or other specs, I know that is kinda of 100 euros! Shall I buy it? I want to integrate it with my openhab home control already running on a rpi. That's just the home hub, so no remote control, but yes that should be compatible with OpenHAB. However, I'm not sure the limitations - I suspect it can't learn any unknown codes without the remote, so you'd be stuck with whatever's in the database, and there may be a limit on the number of devices you can add. I am struggling to change the timings on the x axis on the chart of rrd4j. I am from India and the timing is not matching with my local timings. Thanks for answer James! So what you suggest? If I wannna learn some unknown codes as for eg a lightning strip with remotes, do I need the ultimate one? Or it's enough to only the hub? I didn't underatand well the procedure registering devices into the hub! .....and can see the data in MQTT tester on local network, so i now that side of things is ok. Sorry Everyone I got it. Thankyou for a really execlent guide to a very complcated system...i am persivering and hopefully one day it will all come together !!! James - thank you sooo much for this in-depth tutorial. This was exactly what I needed after much frustrating searching. So I have it all down to the wire. Can i assume that my mosquitto is installed and working correctly because I received data when using just the command line? Is there some other variable that i'm forgetting? That's a nasty error, and not something I can help with I'm afraid. Head over to http://community.openhab.org and someone there should know more. The only reference I can find to something similar is here: https://github.com/openhab/openhab/issues/980 , but that was old and apparently solved. Regarding the Arduino MQTT sensor, I just set up a similar system built on one of the ESP8266 variants (I like the NodeMCU lua developement boards, as versions can be found on Ebay for $4 shipped!) and there is a mDNS library included with the arduino environment for these which allows the use of "Friendly" hostnames rather than IP addresses. in your setup function and your done. Works a charm for me, but my network environment is all Linux, so I have not tested with Mac or Windows machines. I think it should work though. Since MQTT works properly I would like to start datalogging. Well what does your debug log say? Do you see the messages saying the rrd4j is storing values every minute, or when they're getting updated? If it's not storing them properly, you'll need to confirm rrd4j is installed right, correctly permissions, and that your config is correct. Confirm each step before moving on to the next. Thanks James "/" was the issue - for the second time! next time I will read before posting. Im struggling with mosqitto connection to openhab. when I try other mqtt connect to rpi it works flawlesly. 2016-03-14 22:38:25.349 [DEBUG] [.b.mqtt.internal.MqttActivator] - MQTT binding has been started. 2016-03-14 22:38:25.570 [DEBUG] [i.internal.GenericItemProvider] - Start processing binding configuration of Item 'temperature (Type=NumberItem, State=Uninitialized)' with 'MqttGenericBindingProvider' reader. 2016-03-14 22:38:25.724 [DEBUG] [i.internal.GenericItemProvider] - Start processing binding configuration of Item 'temperature2 (Type=NumberItem, State=Uninitialized)' with 'MqttGenericBindingProvider' reader. 2016-03-14 22:38:25.847 [DEBUG] [m.internal.MqttEventBusBinding] - MQTT: Activating event bus binding. 2016-03-14 22:38:25.915 [DEBUG] [m.internal.MqttEventBusBinding] - MQTT Event Bus Binding initialization completed. But I'm also not familiar with using the eventbus part of the binding, I've only used the direct subscription. Perhaps remove the eventbus stuff until you've got the basic channels working. Time cron "0 0 6 ? * MON-FRI *"
Time cron "0 0 8 ? * MON-FRI *"
I have followed your example, so I'm hoping that's correct. But I'm not really sure what to do with it now? and how I make it active? I see there is a demo rules file, I was thinking I need to create a new rule file, but how does openhab trigger the rules? Do I need to do anything else? As long as it's correctly formatted, and saved in the rules folder with a .rules extension, it should work. Check the main log if you have debug enabled (see the first tutorial on how to to do that), and when you make any changes to the ruels file it should re-read it, say it parsed correctly, and give you a message saying something has been scheduled accordingly. At the time of the event, you'll also find any errors in the log file about why it wasn't triggered if there was a problem. Thank you for these tutorials! One issue I had with Z-Wave: I was getting the "Port /dev/ttyUSB0 does not exist" messages in my openhab log (Aeotec Z-Stick Series 2 on Ubuntu 14.04). Turns out to be the same permission issue you identified. So your comment about this not applying to devices on ttyUSB* is not quite correct (at least for my configuration). Once I did sudo "adduser openhab dialout", openhab was able to recognize the Z-Stick. Thanks Steve, I've removed that line now so it just reads as necessary for all. Thanks for your awesome tutorials! It was very nice to stumble across these after digging/fumbling around to figure a lot of this stuff out on my own. Very helpful to have it all laid out and in one place. I followed your instructions for setting up z-wave and mqtt flawlessly. Thanks again! Many thanks to the OpenHab forum. I am completely stuck. The arduino works fine; I even added a barometer; Raspberry is installed, Mosquitto etc. seem to work. at MQTT.fx shows the data from my DTH22 sensor and the barometer. Very cool. and thats where things go wrong: everything UNDER this label is not showing; I just see ädruino" and nothing below. When I move the frame to the bottom everything shows, except my sensor data. The first one works and the second one does not. I took this directly off the github and can't figure out why the master bedroom one doesn't show up. Any thoughts? Try using a qualifier for each hub, not just the extra one. Also, emable debug output, the Harmony Hub binding is quite verbose and might be an obvious error in there. Excellent job, would be nice to have a full guide to start with the initial installation. As all the sudo apt-get inatallations of openhab doesn't work from scratch. Mine is working very well without the apt-get install. Therefore any change has to be manually which is a slow task and not always up to date. Keep doing the good manuals!! You've done.